Happy 20th Anniversary to “A Star Is Burns”! Original airdate: 5 March 1995. Ah, yes, the only Simpsons episode not to have Matt Groening’s name on it. Why can’t he show that kind of initiative with anything after season nine. He was working more on “Futurama” than this show. 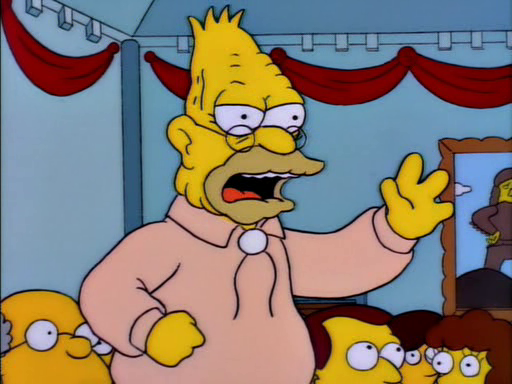 **”Boo-urns” vs. “Boo!” over Mr. Burns’ movie. The episode would have been better if it focused on Mr. Burns making a disastrous vanity movie and Jay Sherman from “The Critic” just happened to cameo so he can trash it in his reviews. The episode is called “A Star is Burns” and I think a lot of people were pissed that it didn’t focus on Mr. Burns, since, prior to his zombification, he was considered the best character on the show. For what it’s worth, Jean/Reiss episodes aren’t exactly known for having really strong stories. That probably explains why Jean running the show by himself is such a disaster (Reiss was somehow his buffer for bad/weak ideas and was able to inject something that was funny/germane to the story).